It was a perfectly ordinary business deal, in Vermont in October of 1830. A man named Lyons bought a horse from a man named Strong. Lyons had ridden and tried the mare out, and Strong had said the mare was perfectly sound in every way. He only wouldn’t warrant her against gravel — a type of hoof abscess. Just about evening, the two finished up the bargain, with Lyons paying an ox and a cow and three dollars in money for the mare. But the deal went sour. It turned out the mare really did have gravel. And Lyons wanted damages for the breach of warranty. Strong’s defense to the suit? The deal had gone down on a Sunday… and Vermont law didn’t look kindly on business deals on Sunday. 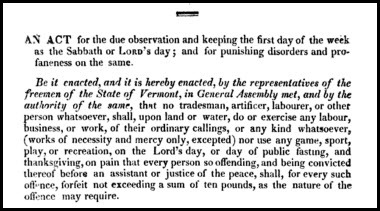 But because the law was what it was, and the Court ruled what it ruled, we all know more about what our ancestors might have done — or not done — and why, at least in Vermont (and anywhere else there was a similar statute, which, by the way, was just about everywhere for a very long time in America11). Why didn’t our Vermont ancestors do business on Sundays? Even in my memory, Pennsylvania did not allow an inning to begin after 7 PM on Sundays. The games would be completed at another date. I remember voting on New Jersey’s blue law repeal, Israel — not just my lifetime, but my adult voting lifetime! Even if the trade had taken place, say, on a Monday, I don’t see where Lyons would have had a case, if the sale was “as-is” regarding abscesses. Does the Vermont Supreme Court decision address whether the contract would have been valid if not for the Sunday issue? Nope, it sent the case back for Lyons to try to argue that the statute ought not to apply for other reasons. It didn’t reach any issue except the legality of a contract made on Sunday. Feeding them would certainly have been necessary!! Yes, Republic of, not State of, initially! When I was growing up in Washington State in the 1950s and early 1960s, stores, including grocery stores, couldn’t be open on Sundays. I remember that law being repealed, though not the year. But state liquor stores were still closed on Sundays for years after that. I don’t know when those “Blue Laws,” as they were called here, were repealed, as I moved away in 1969. When I came back in 1997, of course everything was wide open. Only within the last few years did liquor begin to be sold in other kinds of stores, as the state liquor stores were shut down. This irks me no end, as it has some unintended negative consequence besides the obvious ones that liquor is sold where young people have easier access to it. Because liquor makes more profit for, say, a drug store, than inexpensive watches or watch and hearing aid batteries, they’re no longer available there. One argument the state made in its desire to privatize the sale of liquor was that it would make more on the tax, but in fact they’ve made less. So the state budget now has less to spend on schools. Something is wrong here, besides noisier Sundays and fewer people in church! I feel like I’m missing something. I understand that the warranty was unenforceable because the contract was made on a Sunday, but why wasn’t the underlying agreement of purchase and sale also not found to be unenforceable? I would expect that the contract would be void ab initio, such that the parties would have been put back into the position they were in prior to entering into an illegal contract. Lyons would get his ox, cow, and $3 back and Strong would take the horse back. The court didn’t reach the other issues, Sean: it limited its decision to the one issue brought by the appellant — whether the contract was enforceable because it had been entered into on Sunday. I. Matter of Samuell Allys (27 April 1674) (“Samuel Allys fed 5s. Samuel Allys of Hatfeild being presented and Complained off for Throwing a Stone at James Browne at Hatfeild on the 12th of this Instant Aprill on the Sabbath Evening alitle after evening shut in Whereby James Brown was pretty much wounded on the eyebrows. … [T]he said Samuell Allys also owning it only saying he did not intend to hurt him but only tossed it in waggery But hurt being done and it being on the Sabbath Night … I order the said Samuell Allys to pay five shillings as a fine to the County and to defray the charge of John Colemans Coming downe with him to discharge all charges …”). Colonial Justice in Western Massachusetts (1639 – 1702): The Pynchon Court Record (Joseph H. Smith, ed., Wm. Nelson Cromwell Foundation, Harvard, Univ. Press, 1961) at 279 – 280. II. Commonwealth v. Wolf, 3 Serg. & Rawle 48, 1817 Pa. LEXIS 10 (Upholding conviction of defendant for violating prohibition against doing business on Sunday, and finding no exception where defendant is of Jewish faith and observes Sabbath on Saturday.). III. Matter of Congregation Darchei Noam, N.Y.L.J., 12/31/1991, p. 32 (Sup. Ct., Nassau Co. 1991) (Zoning Board’s unconditional refusal to grant parking waivers for synagogue vacated as an arbitrary and capricious failure to accommodate religious observance. “Consideration of the relief here requested, where congregants cannot drive on the Sabbath, requires special sensitivity to the First Amendment. Otherwise, they are confronted with either abandoning a practice of their religion or their homes.”). Oooof. Sounds like a law school class final exam to me!